Optimal Home Blood Pressure Monitoring: Must The Legs Be Uncrossed and The Feet Flat? The new ACC/AHA guidelines for High Blood Pressure were published late last year and they were in favor of using home blood pressure measurement to aid in the management of hypertension. I was happy to hear this as I am constantly advising my hypertensive patients to buy a home BP cuff, measure their BP once when they get up and again 12 hours later and report the values to me after two weeks. • Avoid smoking, caffeinated beverages, or exercise within 30 min before BP measurements. • Ensure ≥5 min of quiet rest before BP measurements. • Sit with back straight and supported (on a straight-backed dining chair, for example, rather than a sofa). • Sit with feet flat on the floor and legs uncrossed. • Keep arm supported on a flat surface (such as a table), with the upper arm at heart level. • Bottom of the cuff should be placed directly above the antecubital fossa (bend of the elbow). • Take at least 2 readings 1 min apart in morning before taking medications and in evening before supper. Optimally, measure and record BP daily. Ideally, obtain weekly BP readings beginning 2 weeks after a change in the treatment regimen and during the week before a clinic visit. • Monitors with built-in memory should be brought to all clinic appointments. I monitor my own BP at home and often wonder whether there is scientific evidence to support such a rigid protocol. Being a contrarian and a skeptic, I typically violate 3/4 of the recommendations that are listed. It seems like all of the instructions are guaranteed to give you the lowest BP you are likely to experience during the day. The vast majority of the time I am not sitting quietly with my legs uncrossed, my bladder empty and my back straight so following these directions will underestimate my average daily BP. Sit with feet flat on the floor and legs uncrossed. What if you are on an exam table and your feet don’t reach the ground? Does it really make a difference if your feet are flat on the ground versus slightly crooked? Does any degree of leg crossing influence BP? Legs crossed at the ankles? Legs crossed at the knee? And once I began thinking of leg crossing I realized that I spend a lot of my time with my legs crossed. Was this raising my blood pressure and my cardiovascular risk? Did I cross my legs because I liked the feel of a higher blood pressure? 3.5. Measurements should be taken in silence when the patient is relaxed, with both feet flat on the floor and their back and arm supported. Many patients automatically cross their legs, which raises their blood pressure, so it is particularly important to emphasise the need for the patient to uncross their legs when taking their blood pressure. Apparently the Brits believe that any ambient sound will alter the blood pressure. Talking is right out! But if talking, ambient sounds and crossing your legs raises your blood pressure shouldn’t we be advising patients to spend their days wearing ear plugs in silence with their legs uncrossed? It turns out there are good studies showing that leg crossing raises your blood pressure. The first was published in 1999 and involved 53 hypertensive and 50 normotensive subjects. Here I am demonstrating method 2 with my lateral malleolus carefully placed on my suprapatellar bursa. I actually prefer method 1 which is depicted below. Legs crossed , method 1-popliteal fossa of the dominant leg over the suprapatellar bursa of the non-dominant leg. Legs crossed, method 2- lateral malleolus (which the article spells mallelous) of the dominant leg over the suprapatellar bursa of the non-dominant leg. Systolic blood pressure in patients with hypertension increased by 8 mm Hg by method 1 leg crossing and 10 mm Hg by method 2. Figure from Adiyaman, et al. demonstrating method 1 on the left. Another study demonstrated that although crossing the legs at the knees influenced blood pressure, crossing them at the ankles had no effect. A recent review identified 7 studies which support the influence of leg crossing on BP. If leg crossing raises the systolic blood pressure 8 to 10 mm Hg why aren’t we doctors recommending patients sit with leg uncrossed the majority of the time. Personally, I had never heard there were any health complications to sitting with my legs crossed. Apparently the myriad health information sources on the internet are near unanimous in their condemnation of leg crossing but the hypertensive effect of this maneuver is usually not cited. I must admit since doing this bit of research I have substantially reduced the amount of time I sit with my legs crossed. And I’ve pondered extensively whether sitting with legs crossed makes me feel any different and why I suddenly and seemingly randomly decide to cross my legs. I’ve also started asking friends and colleagues and medical residents how much of the day they spend with legs crossed. On teaching rounds one morning recently we tested a volunteer resident’s blood pressure with legs crossed and uncrossed. Sure enough, the systolic BP was 10 mm Hg higher with legs crossed. 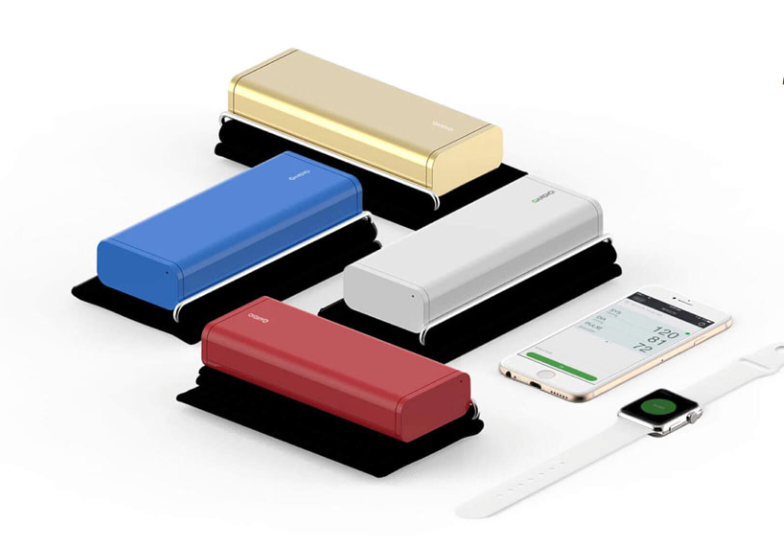 QardioArm: Stylish, Accurate and Portable. 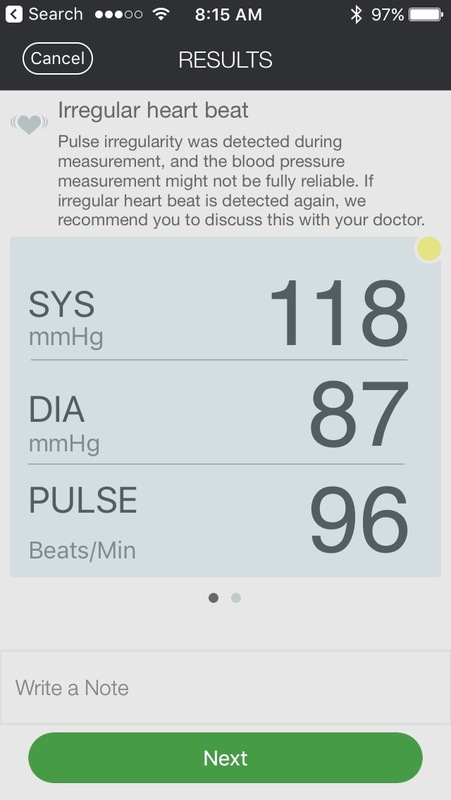 Is It the iPhone of Home Blood Pressure Monitors? The skeptical cardiologist frequently has his hypertensive patients check their BPs at home and report the values to him. 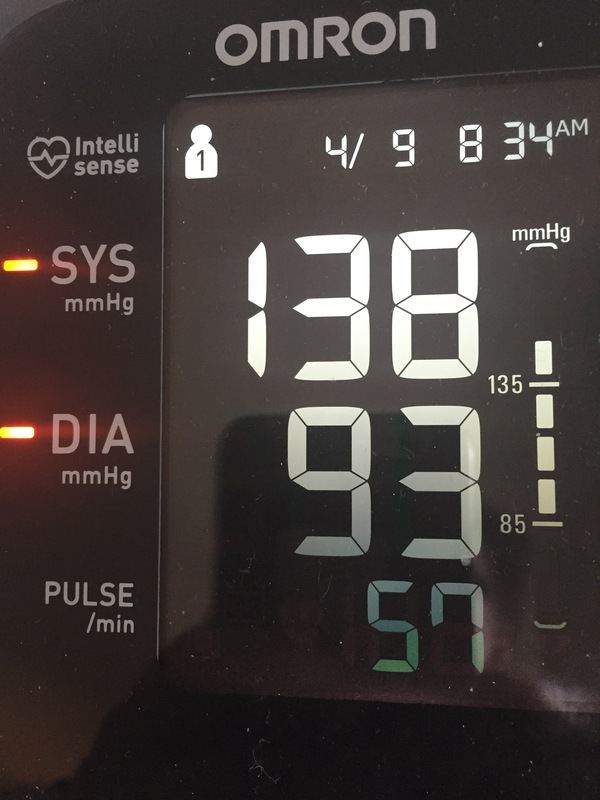 An easy, accurate and efficient way to record BPs at home, and transmit to the doctor, is my Holy Grail for management of hypertension; QardioArm offers to improve on this process compared to more conventional home BP cuffs. I recently bought a QardioArm for my father and tested one myself over the last month, and herein are my findings. I compared it closely to my prior “go to” BP device, the Omron 10 (which I recommended as a Christmas gift here). The QardioArm looks like and is packaged like an Apple product. The box containing the device is esthetically pleasing, and can serve as an excellent storage and transportation mechanism. 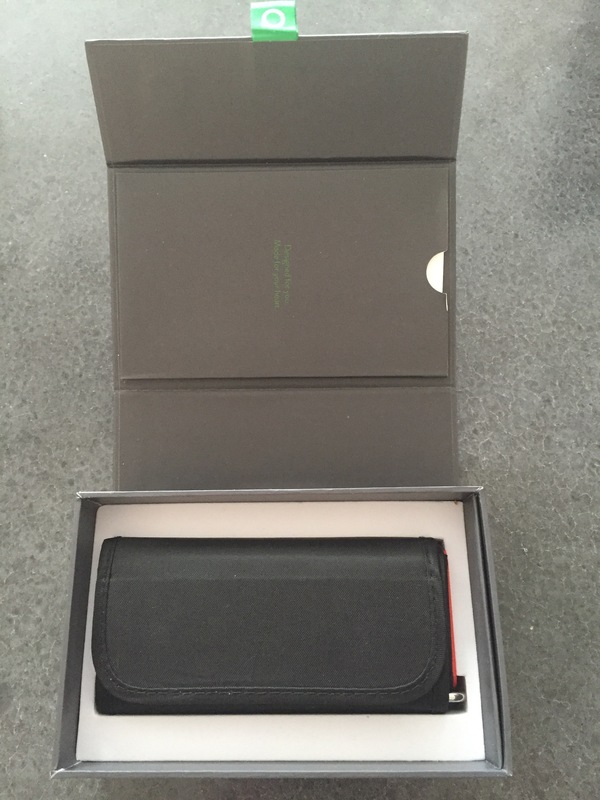 The case closes magnetically and has a pocket, within which resides the manual. Upon removing the QardioArm, one is struck by how compact, sleek and cool it looks. This is not your father’s BP cuff. There are no wires or tubes coming off it, and the cuff wraps around a red (white, blue or gold) plastic rectangular cuboid. 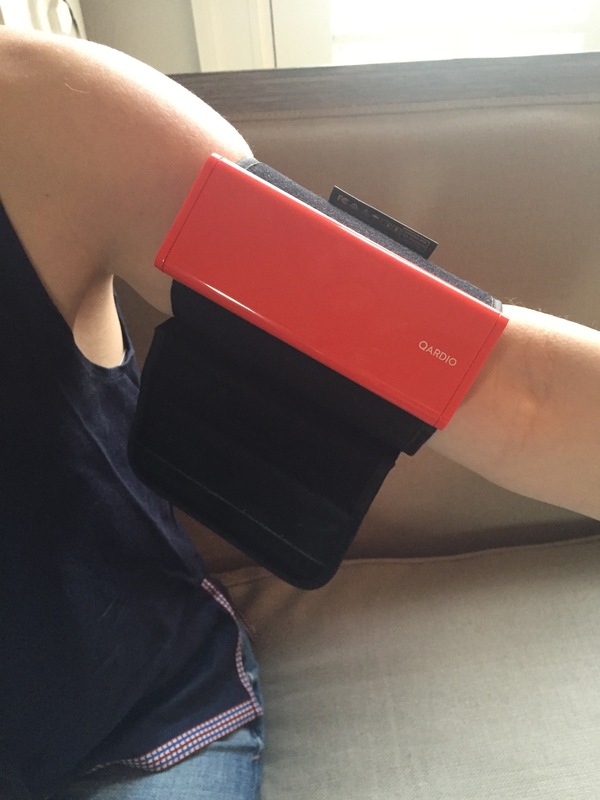 The cuff/cuboid is small enough to easily fit in a purse or satchel, facilitating portability. Once you understand how the device works it is a breeze to use. However, if you are inclined, like me, to skip reading the instruction manual, you run the risk of being incredibly frustrated. First, you must download the free Qardio App to your smartphone, create a user login, register and create your personal account. If you don’t have a smartphone or tablet or don’t use the internet, this cuff if not for you. For me, this was a simple, quick process. After setting up the Qardio App, you pair the QardioArm with the App. This requires the QardioArm be on and Blue Tooth be enabled on your smartphone. would be an incredibly easy and obvious process: it is not (unless you pay close attention to the instructions). If you read reviews of Qardioarm on Consumer Reports or Amazon, you will encounter many very unhappy users. This is primarily because some folks could not get it to turn on. There is a small magnet inside the cuff. The device turns itself on when you unwrap the cuff and it turns off when you wrap the cuff back up. (I am not good at wrapping things up properly and ran into issues initially because of this). When you wrap the cuff up properly you can feel the magnet locking into place and thus turning the device off. When the device is on there is no light to indicate it is on. A green light flashes on the side when it turns on, but then goes out. Many user reviews indicate frustration with this and often they end up trying to change the batteries, believing that the device is dead. I went through this same thought process initially. The device turns off “after a few minutes” if not used. You won’t know if it is on or off. If it doesn’t respond when you trigger it from the App, you must carefully rewrap the cuff and then unwrap it. If you don’t trigger the device properly with the magnet, it won’t wake up. The QardioArm encircling the beautiful arm of the eternal fiancee’ of the skeptical cardiologist. Note: when the cuff is wrapped around my unattractive arm, it fastens properly and does not hang down. hit the big green START button and sit back while the cuff is magically inflated and an oscillometric measurement of your blood pressure performed. 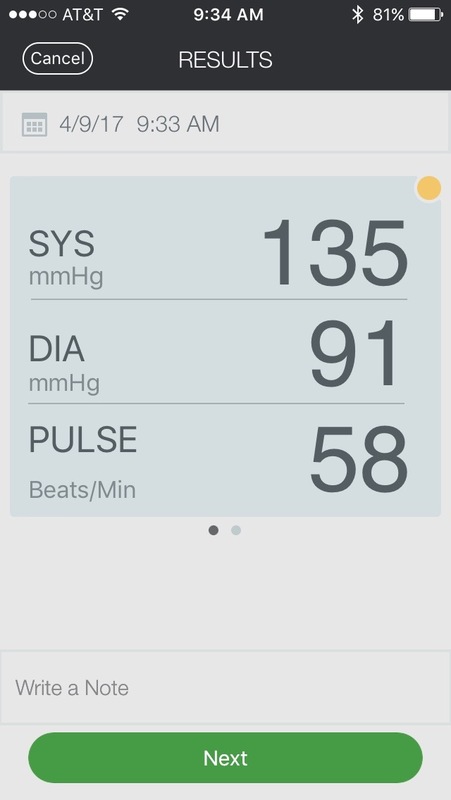 The blood pressure is displayed on the app instantaneously along with pulse. If the device detects irregularity of the pulse (a possible but not reliable sign of atrial fibrillation or other abnormal heart rhythms), it display an “irregular heart beat” warning. You can have the QardioArm take 3 BPs, a variable amount of time apart, and average the readings. QardioArm is a highly accurate blood pressure monitor and has undergone independent, formal clinical validation according to ANSI/AAMI/ISO 81060-1:2007, ANSI/AAMI/ISO 81060-2:2009, ANSI/AAMI/IEC 80601-2-30:2009, as well as British Standard EN 1060-4:2004. QardioArm is a regulated medical device: FDA cleared, European CE marked and Canadian CE marked. It measures blood pressure with a resolution of 1 mmHg and pulse with 1 beat/min. The accuracy is +/- 3 mmHg or 2% of readout value for blood pressure, and +/- 5% of readout value for pulse. I spent time evaluating the accuracy of QardioArm because a few online reviewers suggest that it is highly inaccurate for them and Consumer Reports gives it a “poor” rating for accuracy. Consumer Reports gave the QardioArm an astonishingly low score giving it lower marks than the Omron for Convenience, Accuracy and Comfort. It gave the QardioArm a Poor mark for accuracy. No details of their measurement data are available on the site. I compared it to the Omron 10 (Consumer Reports highest-rated BP device), and found close agreement between the two. I took my own BP with the QardioArm on the left arm and the Omron 10 on the right arm. Multiple simultaneous measurements showed less than 3 mmHg difference in systolic blood pressure between the two. QardioArm is faster. It took 30 seconds to complete a BP measurement, compared to 50 seconds for the Omron 10. BPs are immediately available on my iPhone with QardioArm, whereas a separate Bluetooth synching process is required for the Omron App. This process never works well for me, as the Omron fails to transmit measurements reliably. It is amazingly easy to transmit BPs via email to your doctor (or friends if so inclined). I found the QardioArm website to be very informative and helpful. The manual that comes with the device is very complete and you should definitely read it before using the device. I did not need telephone or email support services, so I can’t comment on those. Despite an initial frustration with QardioArm, I ended up really liking this device a lot. 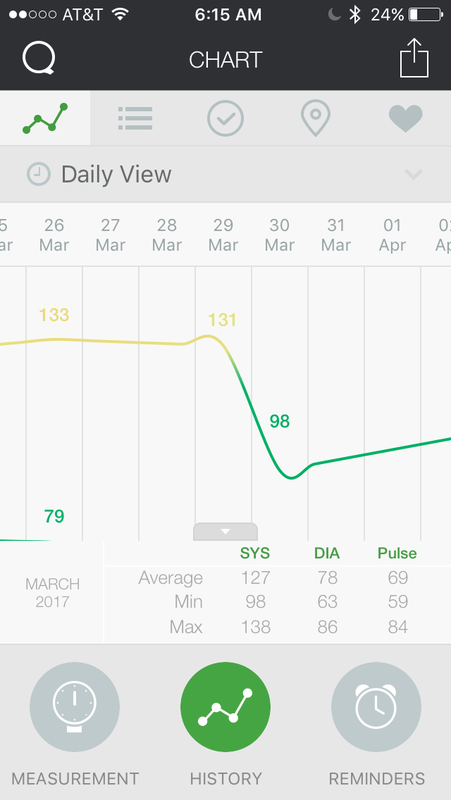 This sounds a little silly but the QardioArm improved the esthetic experience of home BP monitoring for me. Because it is compact, sleek and attractive, patients may be more likely to utilize it on a regular basis. In particular, I see it as something that you would be much more inclined to take with you for BP monitoring at work or on vacation. I will be recommending this to my tech-savvy, style-conscious patients who require home BP monitoring. Previously, this type of patient would bring in their smartphone and show me the accumulated data from their BP readings. With a QardioArm, they can easily email my office the data and we can have it scanned into their record. My final caveat: the QardioArm I gave my father for his 91st birthday does not work on his arm. It works without a problem on the arms of his friends and relatives. I have no idea why, but fortunately QardioArm honored their 30 day 100% money-back no questions asked guarantee. I’ve asked him to give me his nonagenarian perspective on the QardioArm experience so I can share it in a future post. The skeptical cardiologist found himself reading a cookbook the other day, something he heretofore had avoided. Cookbooks somehow seem archaic and, I presumed, exclusively the domain of the women in my life. My mother had loads of them, hiding their food-stained bindings behind a cabinet door in my childhood kitchen. Whereas I can stare longingly at all manner of books on bookstore shelves, I scrupulously avoid the cooking section, finding nothing that intrigues or attracts me in their heavily illustrated contents. The eternal fiancee’ of the skeptical cardiologist (EFOSC), I believe, had requested I find the recipes for several dishes we (more accurately, she) could prepare the next week and had headed off to Whole Foods or Nordstrom Rack or Pier 1 (all of which, strangely and conveniently sit side by side). 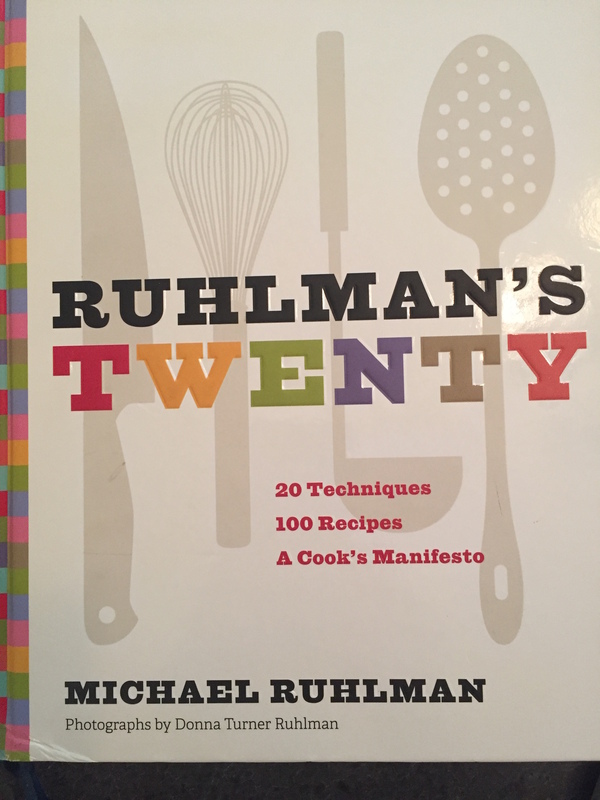 After receiving directions on where these mysterious tomes resided, I grabbed the cookbook that looked the most interesting: Ruhlman’s TWENTY: 20 Techniques, 100 Recipes, A Cook’s Manifesto. Instead of searching for recipes I ended up being distracted by Chapter 2: Salt: Your Most Important Tool. As I’ve written previously, I agree with him, and a recent article published in The Lancet casts further doubt on recommendations for the general population to limit sodium consumption drastically. In the Lancet article, the authors did a pooled analysis of four large prospective studies involving 133118 patients in 49 countries. They studied the relationship between salt consumption, measured by 24 hour urine excretion of sodium (because what goes in must come out) and the incidence of cardiovascular disease and death over about 4 years. Patients without hypertension who excreted more than 7 grams/day of sodium were no more likely to have cardiovascular disease or death than those excreting 4-5 grams/day. In fact, in both normotensive and hypertensive groups, sodium excretion of < 3 g/day was associated with a significantly (26% higher in normotensives, 34% in hypertensives) increased risk of cardiovascular disease and death. The only group that would appear to benefit from lower sodium consumption was the hypertensive group which excreted 7 g/day of sodium and when compared to the hypertensive group that excreted 4-5 g/day of sodium had a 23% higher risk of CV death and disease. If we have to worry about anything with salt consumption, this study (and others) suggests that it is consuming too little salt. The only group that need worry about too much salt consumption is those who have hypertension and who consume a really large amount of salt. Since the average American Average consumes 3.4 grams per day of salt, very few of us are consuming over 7 g/day. Despite this, The American Heart Association continues to stick by its totally unjustified recommendation that sodium levels be no higher than 1,500 mg/day, and other organizations recommend sodium levels below 2,300 mg/day. Ruhlman recommends coarse kosher salt, preferably Diamond Crystal or, if that’s not available, Morton’s. He feels that salting is an inexact skill and one should always salt to taste. These words were music to my ears as I am an advocate of serendipity, chaos and creativeness in the kitchen. When I make a frittata, as I did this morning, I measure nothing precisely; not the butter and olive oil used to sauté, the bell peppers, onions and garlic; not the milk mixed with the eggs; not the cheese sprinkled on top; not the time spent in the oven or even the heat; and most assuredly, not the salt and pepper. 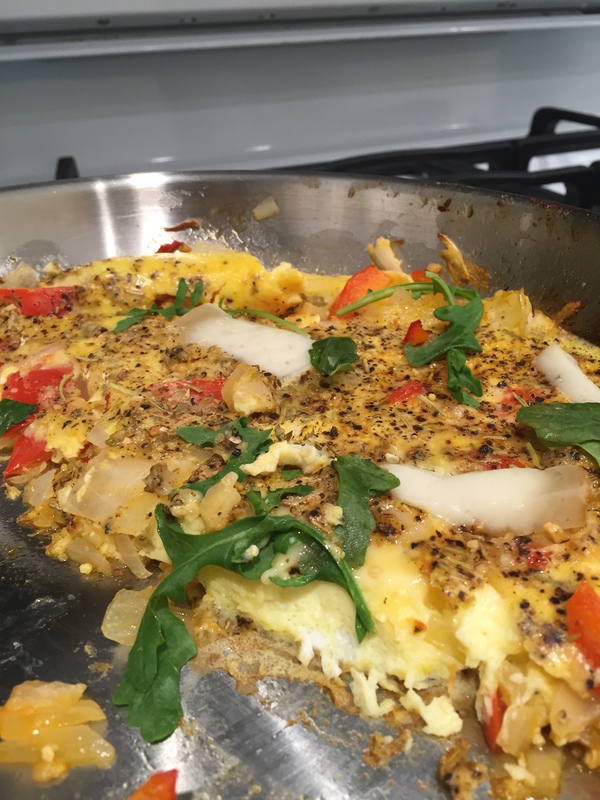 At the end of the frittata creation process I took a bite. It was delicious but it needed something: a touch more salt. 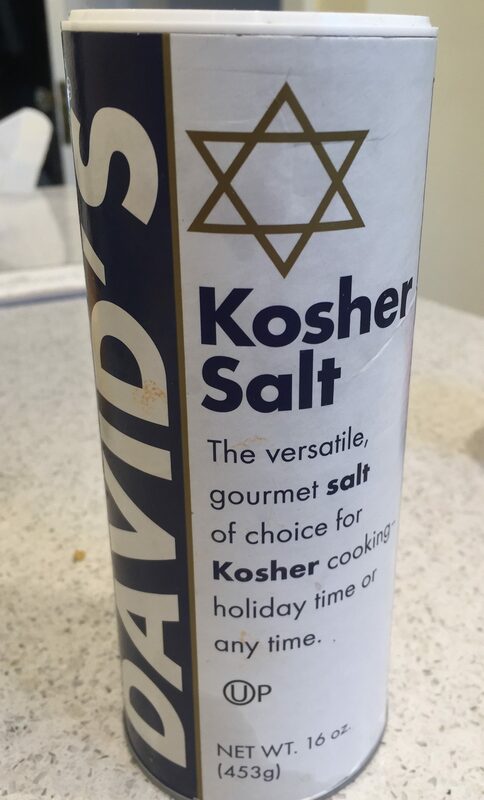 I sprinkled some David’s kosher salt on top and tried again, Perfection! Although I have hypertension, I know (see discussion here) that my salt consumption is way below 7 grams/day and, if anything, based on the most recent studies, I should be worrying about too little sodium in my diet. The skeptical cardiologist was shocked to hear that there was a smartphone app which he had heretofore been unaware of that claimed to measure blood pressure. Made by Aura Life and named Instant Blood Pressure, the app was apparently selling like hotcakes on the Apple app store until it was abruptly removed in 2015. Since it was created by “a team of forward-thinking biomedical engineers and software developers” and is to be used to measure one’s blood pressure one might be fooled into thinking that it might accurately measure blood pressure. Don’t be silly! How does one use a blood pressure device that is not really intended to measure blood pressure for recreational use? Beats me. A research letter in JAMA Internal Medicine reports that the app is really inaccurate: 77% of patients with hypertensive blood pressure levels were assured that their blood pressure was in the nonhypertensive range. Between its release on June 5, 2014, and removal on July 30, 2015 (421 days), the IBP app spent 156 days as one of the top 50 best-selling iPhone apps; at least 950 copies of this $4.99 app were sold on each of those days.2Validation of this popular app or any of the similar iPhone apps still available (eg, Blood Pressure Pocket, Quick Blood Pressure Measure and Monitor), have not been performed. Don’t rely on any smartphone app to accurately measure your blood pressure. None of them have been validated and they are being promoted by charlatans looking for a quick buck off naive consumers. Excuse me while I check my BP with my Omron 10 real BP monitor. I think it might be really high now. As December draws ever closer to the twenty-fifth you may find yourself behind the wheel of a large automobile puzzling over the perfect gift for your loved ones. Fear not, for the skeptical cardiologist has a few suggestions to help you. If your hypertensive friend or relative already has all the standard BP paraphernalia (pill splitter, basic BP cuff), owns a smart phone and has an engineer or scientist approach to data the Omron 10 (BP786, 59.99$ at Best buy.com) just might be the perfect gift. The skeptical cardiologist recently purchased two (that’s right two) of these in anticipation of Christmas. Christmas arrives with multiple stressors guaranteed to hike your blood pressure. Averaging/automating three consecutive readings. After reading about the SPRINT BP trial which showed a benefit of aiming for SBP of 120 over 140, I thought I should try to reproduce the method used in the trial. This involved measuring BP 3 times separated by 5 minutes and averaging the results. The Omron 10 can be set to make and average three BP readings separated by a variable time period. The ability to communicate with an iPhone or Android smartphone and record and display the data in an app. Works off both batteries and plug in electrical power. I thought my dad (a retired chemist) would like the Omron 10’s features but, alas, he informed me that if he wanted to average three BP readings he could just write down the numbers and do the math. If he had an iPhone he might really like the way the Omron sends its data to the free Omron app. The app displays BP and heart rate readings recorded for different time intervals. You can take a screen shot like I did here or email it and share the data with your doctor through the doctor’s patient portal! I’ve mentioned this really cool device a few times (here and here). It is now listed on Amazon.com for $57 (a significant drop from when I purchased it) and can be attached to your smartphone case. It does a really good job of recording a single lead electrocardiogram (ECG) and diagnosing normality or atrial fibrillation. If your friend or loved one is experiencing periodic fluttering in their chest or a sensation of the heart skipping beats or racing (the general term for which is palpitations) then this could be the perfect gift. A number of my patients have purchased these and have made ECG recordings which I can review online. Primarily I have been recommending them to my patients who have atrial fibrillation periodically. 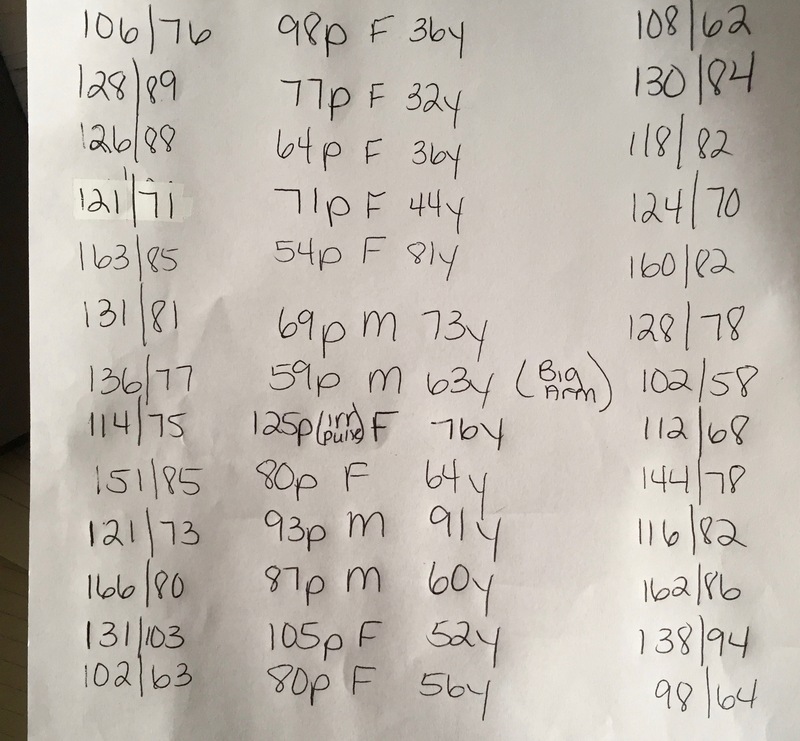 You may think this is too complicated a device to master but last week I saw in my office a 94 year old lady who had had an episode of atrial fibrillation earlier in the year. Since her last visit she had purchased an AliveCor device and was able to show me the ECG recordings she had made on her iPhone. May your holiday season be joyous, full of loved ones and free of stressors that raise your blood pressure and cause your heart to pound and race. But if it is not, consider purchasing one of these nifty devices. Would you rather have a systolic blood pressure (BP) of 120 mm Hg or 140 mm Hg? Prior to a week ago this sometimes skeptical cardiologist thought treating hypertensive patients to the lower BP didn’t necessarily help avoid death from cardiovascular disease, heart attacks or strokes and that it resulted in more side effects. Clinical trials have shown that treatment of hypertension reduces the risk of cardiovascular disease outcomes, including stroke (by 35 to 40%), heart attacks (by 15 to 25%), and heart failure (by up to 64%) but the target for systolic blood-pressure lowering has been uncertain. I wrote in “Home Versus Office Blood Pressure and the “Landmark” NIH Blood Pressure Trial” about the somewhat premature announcement of the SPRINT NIH trial on blood pressure previously. With the recent publication of the SPRINT trial data (A Randomized Trial of Intensive versus Standard Blood-Pressure Control — NEJM.) there is now impressive evidence supporting the lower target BP and apparently with minimal side effects. The SPRINT trial randomized almost ten thousand patients and compared the effects of antihypertensive treatment with a systolic blood pressure (SBP) target of <120 mm Hg (intensive treatment) versus <140 mm Hg (standard treatment). They studied hypertensive adults ≥50 years of age who had an average SBP of 130–180 mm Hg (the acceptable upper limit decreasing as the number of pretrial antihypertensive medications increased) and were at additional risk for cardiovascular disease (CVD).SPRINT was designed to recruit study participants with an average CVD risk of ≈2% per year, equivalent to a Framingham 10-year CVD risk score of 20%. To understand if these trial results apply to you it is important to know what patients were enrolled in the study (inclusion and exclusion criteria) and I’ve listed these at the end of this post. Average systolic blood pressure was 121 mm HG in the intensive therapy group and 134 mm Hg in the standard therapy group. Drugs used were: thiazide-type diuretics, calcium channels blockers, and angiotensin-converting enzyme inhibitors or angiotensin receptor blockers. Other agents, including spironolactone, amiloride, β-blockers, vasodilators, or α-receptor blockers, could be added if necessary. On average, 2.8 drugs were used in the lower BP group versus 1.8 in the higher BP group. This more intensive BP treatment was surprisingly well tolerated. Very surprisingly, orthostatic hypotension, (drop in BP on standing I talked about in my post on burpees and dizziness) was significantly more common in the standard than in the intensive arm. I would have expected this opposite. There were significantly more kidney problems and electrolyte abnormalities in the intensive group compared to the standard therapy group. This study provides a very powerful argument for shooting for a BP of 120 in many of my patients. And the skeptical cardiologist (who splits BP pills )will be aiming for a lower BP in himself. The NIH yesterday announced that they had prematurely ended a large trial looking at outcomes when hypertensive patients (aged >50 years) were treated to lower versus higher blood pressure goals. The data showing a benefit in those treated to the lower goal were apparently so compelling the scientists tasked with monitoring them felt they needed to be published as soon as possible. These data won’t be published for several months but if they hold up under close scientific scrutiny it will change the way I and other physicians treat hypertension dramatically. The lower BP goal patients in this study were on three BP meds versus two for the higher goal. To achieve a goal of 120 mm Hg I think it is highly likely that I will have to add an additional BP med to all of my patients. With more stringent BP goals it will become crucial to make sure that we are getting accurate BP data on our patients. But what kind of BP data should we be looking at and what technique for obtaining the BP should be employed? Every patient I see in my office gets a BP check. This is typically done by one of the office assistants who is “rooming” the patient using the classic method with , listening with stethoscope for Korotkov sounds. If the BP seems unexpectedly high or low I will recheck it myself. Often the BP we record is significantly higher than what the patient has been getting at home or at other physician offices. There are multiple factors that could be raising the office BP: mental stress from driving to the doctor or being hurried or physical stress from walking from the parking lot. Conscious or subconscious anxiety about what the doctor may find is thought to play a role, so-called “white coat” effects. The skeptical cardiologist’s home BP cuff. Note the early AM systolic BP which is acceptable under current BP guidelines but would be unacceptable if goal becomes <120 mm Hg. Also note that music is about to be played which will lower BP. There are 3 directions in the graphic. 1. Position cuff 0.8-1.2″ above elbow 2. Center tuber over middle of arm 3. Allow room for two fingers to fit between the cuff and your arm. 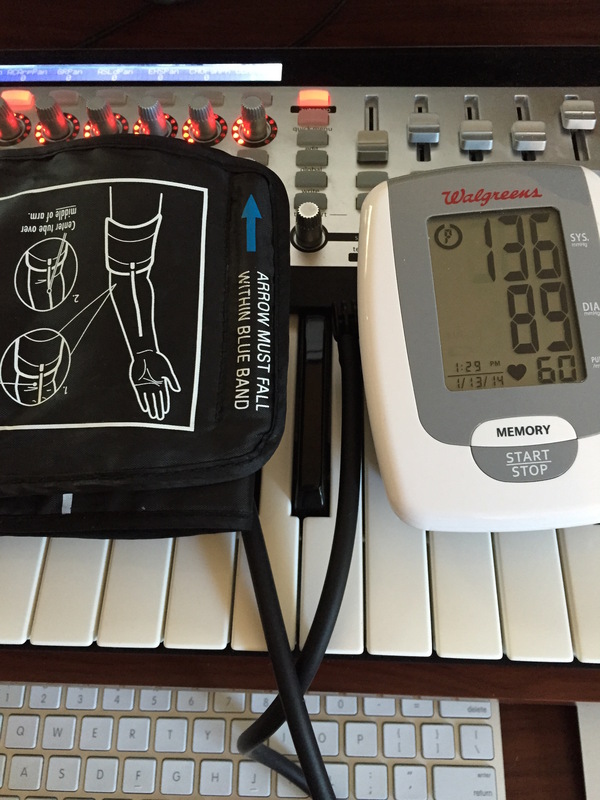 Accurate automatic BP devices can be purchased from Walgreen’s or CVS for around $40. I recommend devices that have a cuff that goes around the upper arm and have as few frills as possible. I usually ask patients to take a BP in the morning and evening daily for two weeks and report the values to me. Don’t drink coffee or smoke cigarettes for 30 minutes prior to the test. Sit for 5 minutes before the test. What is the True Blood Pressure? It seems to me that the most important thing in blood pressure control is what the blood pressure is the majority of the time. Consequently I have always questioned the advice to throw out high readings and to only utilize BP measurements obtained after sitting quietly for 5 minutes. After all, if you are active most of the day as you should be, it would be rare for you to be sitting quietly doing nothing for 5 minutes. The BP you first take, although higher than one 5 minutes later, might be a more accurate reflection of your average BP during the day. Most days you are exposed to a variety of stressors related to work or personal and family situations and your BP is likely reacting to these stressors. 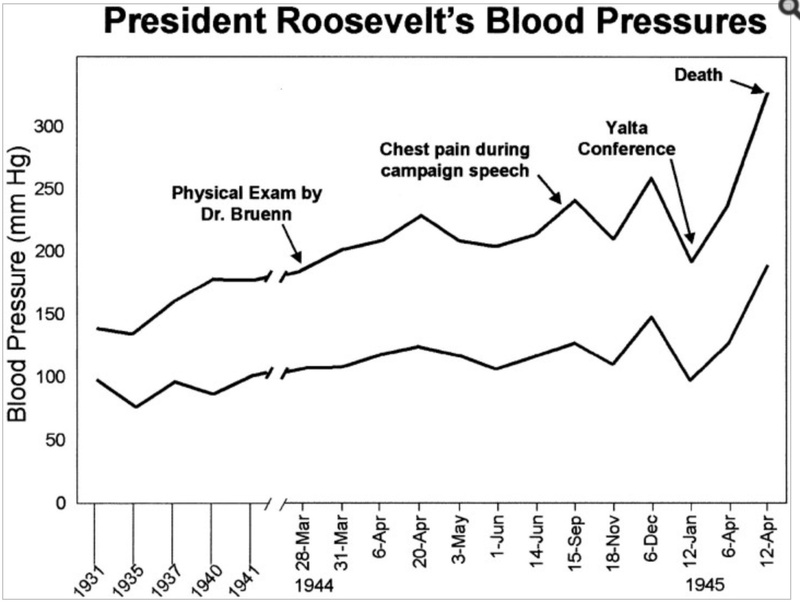 The “sitting quietly for 5 minutes” BP is not reflective of these higher readings. In addition, if you only take your BP when your bladder has just been emptied and you have not had any caffeine it is likely an underestimate of the average daily BP which includes full bladders and cups of coffee. For these reasons I only tell my patients to take the BP twice a day. I don’t instruct them to sit quietly or throw out the high readings or avoid caffeine. I want BPSs that truly represent the normal daily fluctuations. I don’t want to cherry pick “good” BPs. I am eagerly awaiting the publication of the SPRINT data which may alter BP treatment dramatically. Until then I’m sticking to the guidelines published two years ago (and which I wrote about here) which aimed for SBP <140 mm Hg for patients less than 60 years and <150 mm Hg for those older than 60. Does Any Amount of Leisure-Time Running Reduce Your Risk of Heart Attack? The skeptical cardiologist dislikes running. When I start running my whole body seems to be telling me I am making a serious mistake. After running, my knees hurt (worse than the normal level of pain) and if I do enough of it, my hips hurt too. Despite this, I have incorporated running into my exercise routine over the last few years since I stopped playing tennis. I primarily get my aerobic exercise now by using elliptical type devices and I try to get at least 150 minutes of vigorous elliptical work per week. About once a week, I run a mile on a treadmill at 6 MPH. My current patient exercise recommendation is for 150 minutes of moderate intensity aerobic exercise. I have advised patients in the past, that walking at a moderate pace was adequate exercise, and I’ve felt, based on prior studies, that running was not necessary to achieve the cardiovascular benefits of exercise. A new study published recently in JACC has made me reconsider this advice. As part of a prospective longitudinal cohort study at the Cooper Clinic in Dallas, Texas, Lee, et al. looked at data from a group of 55,137 adults on whom they had information on running or jogging activity during the previous 3 months. To reduce confounding bias in the association between running and mortality, the total amount of other physical activities except running was adjusted in all multivariable regression models. They obtained information on death from The National Death Index and over 15 years found 3,413 all-cause death and 1,217 deaths from cardiovascular disease. Those individuals who described themselves as having done any running in the last 3 months had a 30% lower risk of all-cause mortality and a 45% lower cardiovascular mortality. As you might expect, the non-runners were older, smoked more and were fatter. The investigators ran analyses that controlled for the differences in these factors. The protective effect of running, even a small amount, persisted, regardless of age, gender, body mass index, smoking or alcohol consumption. Amazingly, it didn’t matter how much you ran. This finding is quite remarkable. Those who ran <51 minutes per week did just as well as those who ran >176 minutes per week. Of the 20,67 that had two examinations, those who were runners at both examinations had the best outcomes with a 50% lower risk of CVD mortality. These findings are not definitive. We need more studies in this area but they are food for thought. Perhaps the person who doesn’t want to run has a fundamentally different mindset about his/her health than the person who is willing to run just a little bit. Does this inclination to run mirror the person’s overall approach to their health? We can assess factors like cigarette smoking, obesity, diabetes and cholesterol but there are likely (so far) intangible factors that contribute to our health that tend to cluster with a pro-active health attitude. Running a mile in 10 minutes served as a milestone, a fixed goal if you will, for my cardiovascular fitness. I can get a very good idea of where I’m at by measuring my heart rate. I’m 60 years old and my predicted maximal heart rate (220 minus age) is 160. When I’m out of shape, my heart rate will get as high as 155 BPM during the mile, when in shape it is 10 BPM lower. 145 BPM is 91% of my predicted maximal HR. My sense is that a good goal for cardiovascular fitness is to get the heart rate up to 90% or so of your predicted maximal. It may be that running more reliably gets you to that threshold than other activities. Also, as the significant other of the skeptical cardiologist points out, “you can’t cheat at running.” There’s a certain amount of effort you have to put into it and there’s no way to escape it as there is on a bicycle or an elliptical. With walking you could choose a speed ranging from the snail-like up to 4 MPH or so. 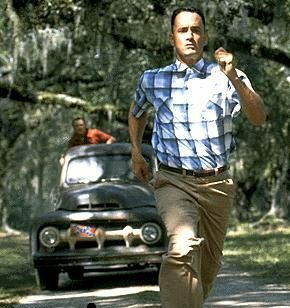 Those who don’t run may also have orthopedic limitations (plantar fasciitis, osteoarthritis, rheumatoid arthritis) or pulmonary problems (COPD, asthma) or undiagnosed heart problems (heart failure, valve defects, rhythm problems) that are not captured by the examinations the investigators performed. Thus, the mechanism through which running or more “committed” exercising improves survival could be mediated through improving the diastolic properties of the heart. I spent most of my academic cardiology career studying diastolic function and it is an incredibly complicated and poorly understood area. Simply put, the heart has to contract to pump out blood (we call this systole) then it has to fill back up with blood (we call this diastole). With aging, the heart’s ability to contract doesn’t change but its ability to fill changes dramatically. Thus, diastolic properties become impaired with aging and this study suggests that dedicated regular exercise prevents that. The other study showed that regular exercise helps to slow age-related increase in blood pressure. Lower blood pressure with aging could be a mechanism for preventing the age-related decline in diastolic performance of the heart. From now on when I talk to my patients about exercise, I will inquire about running specifically and I’ll mention these studies which suggest a little running may go along way toward forestalling the aging process of the heart and lowering their risk of dying.